ConstructConnect’s construction starts are leading indicators for the Census Bureau’s capital investment or put-in-place series. Also, the reporting period for starts is usually one month ahead of the reporting period for the investment series. The normal one-month lag in the timing of data releases has currently been stretched out. Census Bureau workers were off the job for 35 days due to the partial shutdown. Now that they have returned to work, the put-in-place numbers have been updated through November, which leaves them two months behind the starts data. The U.S. construction sector (+52,000 jobs) undertook exceptionally strong hiring in January, according to the latest Employment Situation report from the BLS. The year-over-year change in construction jobs was +4.7%, a faster pace of gain than for any other major industrial subsector. ‘Transportation and warehousing’ (+4.1%) firms were next quickest to add staff. By sub-categories of construction work, the year-over-year climb in jobs was +7.2% for both residential and heavy/civil engineering concerns. Nonresidential builders were more restrained, at +2.9%. Construction’s NSA unemployment rate in January was 6.4%, which marked a continuation of tightening (i.e., improvement) versus January 2018’s figure of 7.3% and January 2017’s 9.4%. January 2019’s year-over-year payroll changes in other pockets of the economy important to construction were as follows: ‘machinery and equipment rental,’ +6.9%; ‘oil and gas extraction,’ +6.2%; ‘real estate firms,&rsquo, +3.3%; ‘architectural and engineering services,&rsquo, +2.5%; ‘cement and concrete product manufacturing,&rsquo, +0.9%; and ‘building material and supplies dealers,&rsquo, -0.3%. The month-to-month decline (-6.7%) in total nonresidential starts in January was caused by a fall in industrial (-23.3%) and similar-sized drops in institutional (-11.0%) and commercial (-13.3%). Only the heavy engineering type-of-structure category (+9.3%) managed a gain. The more substantial year-over-year (y/y) decrease (-20.6%) in total nonresidential starts in the latest month (i.e., January 2018 versus January 2017) was due to shortfalls in commercial (-39.7%), heavy engineering (-19.2%), and institutional (-17.3%). Industrial (+125.3%), on the other hand, chose to dance to a different drumbeat and more than doubled. For every month of the year except January, the narrative in this Industry Snapshot report would now move along to a discussion about year-to-date results. But January is unique in that its individual monthly numbers and its year-to-date (ytd) statistics are exactly the same. The -23.3% drop in industrial starts m/m in January 2019 was due to the absence of a project as large as Micron Technology’s plant expansion in Virginia, estimated at $3.0 billion, which appeared in December 2018’s starts. January 2019 groundbreakings did, however, include several notable industrial projects, led by an ethane exporting facility in Texas, valued at $1.5 billion. On a y/y basis, January 2019 industrial starts were +125.3%. The two primary contributors to ‘heavy engineering/civil’ starts in January 2019 were ‘roads and highways’ (a 38% share) and ‘water and sewer’ works (a 28% slice). Groundbreakings on the former in the latest month were +6.1% m/m, but -1.1% y/y; on the latter, they were a more robust +36.5% m/m, but faltered as well y/y, at -4.7%. Bridge starts, which have been setting a torrid pace over the past couple of years, cooled a bit in the latest month: -4.4% m/m and -12.3% y/y. By a wide margin, the front-ranking share (57%) among institutional subcategories in January belonged to ‘schools/colleges’. Furthermore, the dollar volume of educational facility starts-ups in the latest month was notably positive: +10.6% m/m and +4.1% y/y. The dollar-volume starts performance of a combined medical facility subcategory, – i.e., embracing ‘hospitals/clinics,&rsquo‘nursing/assisted living,’ and ‘medical miscellaneous’ (and jointly accounting for 31% of institutional in January 2019) was deeply negative: -26.0% m/m and -43.4% y/y. Under the commercial umbrella in January 2019, there were numerous subcategories with starts shortcomings. ‘Hotel/motel’ groundbreakings (20% of commercial in January) were -21.2% m/m and -38.9% y/y. ‘Retail/shopping’ starts (15% share) were +11.0% m/m, but -47.7% y/y. Warehouse starts (13%) were +40.6% m/m, but -48.9% y/y. ‘Private office building’ starts were -71.2% m/m and -74.6% y/y. The private-office dollar volume dipped below government offices. The Nonresidential Construction Starts Trend Graphs – January 2019 sets out 12-month moving average trend graphs for key type-of-structure categories. In Graph 1, the nonresidential building curve is gently descending while heavy engineering is gradually ascending. In Graph 2, the commercial and institutional lines are almost on top of one another, with mild weakness developing in 2018. In Graphs 3 through 6, the structure types showing the most uplift of late have been roads/highways and bridges. Those demonstrating a tendency to retreat have been retail and hospitals/clinics. ‘Miscellaneous civil’ in Graph 6 is coming back down to earth but remains one-third higher than its best levels from 2010 to 2015. From January’s Table B-3, the ‘all jobs’ pay increases were +3.2% hourly and +3.5% weekly. Construction workers did worse hourly, +2.8%, but considerably better weekly, +4.9%. From Table B-8, which omits supervisory personnel, the economy-wide compensation increases were +3.4% hourly and +3.7% weekly. Again, construction workers, as a subset, fell behind (but only slightly) in their hourly earnings, +3.3%, but they more than made up for it weekly, +5.6%. Further on costing, December 2018’s y/y results for three BLS Producer Price Index (PPI) series were: ‘construction materials special index’, +6.3%; ‘inputs to new construction index, excluding capital investment, labor and imports’, +3.8%; and ‘final demand construction’, +5.1%. 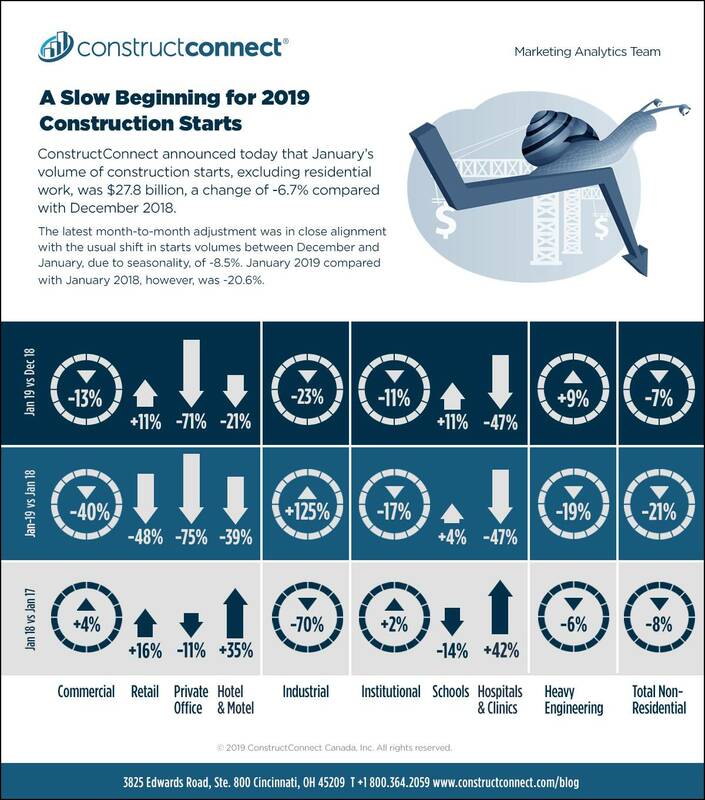 ConstructConnect’s single-family plus multi-family residential starts in January were -3.4% m/m; and -20.3% y/y. ‘Grand total’ starts were -5.4% m/m; and -20.5% ytd. With respect to single-family housing starts during the last couple of months, Census Bureau statisticians, who were sidelined for 35 days by the shutdown, have not been able to provide in-depth guidance. ContstructConnect’s single-family starts numbers for December and January are best estimates. ConstructConnect has moved to a better-targeted and research-assigned ‘start’ date. (Prior to January 2017, the ‘start’ date was recorded as occurring within 30 to 60 days of the announced bid date.) In concept, a ‘start’ is equivalent to ground being broken for a project to proceed. If work is abandoned or rebid, the ‘start’ date is revised to reflect the new information. Table 1 conforms to the type-of-structure ordering adopted by many firms and organizations in the industry. Specifically, it breaks nonresidential building into ICI work (i.e., industrial, commercial and institutional), since each has its own set of economic and demographic drivers. Billions of current $s, not seasonally adjusted (NSA ata Source and Table: ConstructConnect. Table 1 conforms to the type-of-structure ordering adopted by many firms and organizations in the industry. Specifically, it breaks nonresidential building into ICI work (i.e., industrial, commercial and institutional), since each has its own set of economic and demographic drivers. Table 2 presents an alternative, perhaps more user-friendly and intuitive type-of-structure ordering that matches how the data appears in ConstructConnect’s online product Insight. Click here to download the Construction Industry Snapshot Package – January 2019 PDF. This entry was posted on Wednesday, February 13th, 2019 at 3:22 pm. You can follow any responses to this entry through the RSS 2.0 feed. You can leave a response, or trackback from your own site.